I went on a clamp making binge over the past couple of days. I've been annoyed with all of the clamp options out there for gluing solid linings. 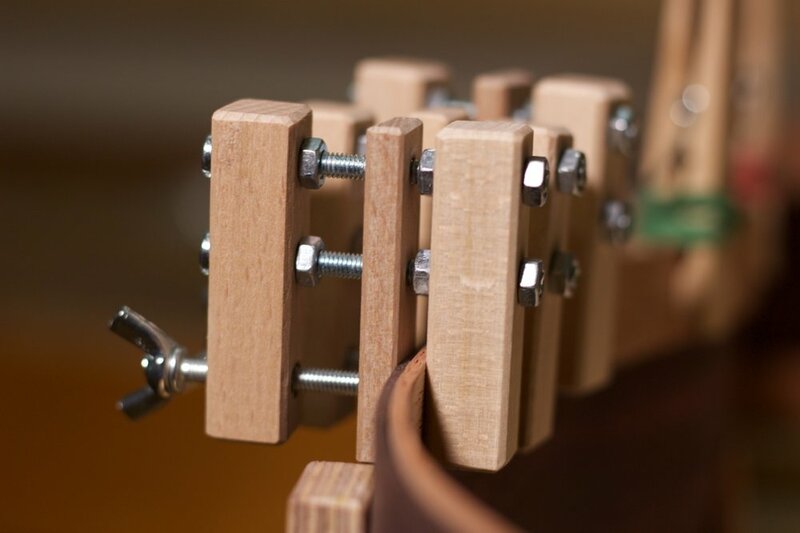 Most of the spring clamps don't apply even pressure and the ones that do are often plastic, the old clothes pin with rubber bands trick is not very good to say the least and any sort of small metal clamps are expensive and dent the interior curves of the linings. So, I made a handful of prototypes this morning and settled on this small wooden clamp. I think that it does a good job and parts-out to about 2 euros per clamp. It applies even pressure and doesn't dent the linings. I'm posting a photo with a list of materials in case anyone wants to copy it. I used beech wood because it was easily available in close-to-final dimensions, so I didn't have to do that much work in preparing it. The placement of the holes is 1/4" from the top, 7/8" from the top and 3/8" from the bottom for the threaded insert. I used epoxy to hold the threaded insert in there better, because I'm a little skeptical of how long it will last, but it seems to work well for the first run.